Look Younger in 10 Minutes with the Ultimate in Skin Rejuvenation. 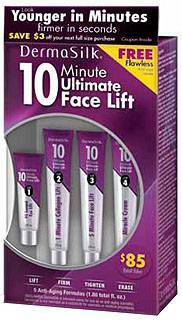 The 5 anti-aging cosmetic products included in this kit are specially formulated to address specific skin concerns. When combined as a daily regimen, the benefits are maximized to give you younger-looking skin. LIFT, FIRM, TIGHTEN, & ERASE.